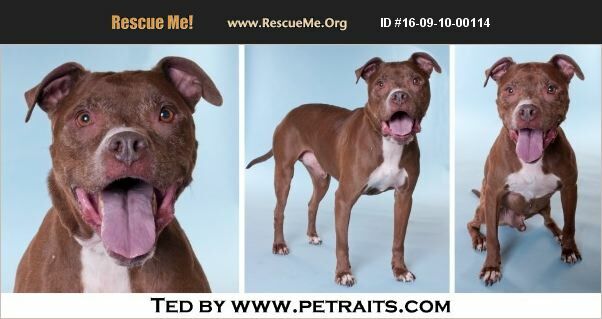 Ted is a very sweet eight-year-old, 52-pound, male, chocolate and vanilla pit bull terrier-mix with gorgeous amber eyes looking for a loving guardian. Ted's family lost their home and had to give up their dog. He is good with other large dogs, but not small dogs or cats. He is living in a foster home in Chicago where he has proven to be housebroken and crate-trained. He knows the commands sit and down and takes treats ever so gently from your fingers. He loves people of all ages including children. He is an easy-going and loving boy. Because he is older, he requires only short play sessions and then he is exhausted and ready for a snuggle and message. He is full of kisses �'�| such a nice boy. Ted is healthy, neutered, up-to-date on vaccines, micro-chipped, de-wormed, heartworm-tested and on monthly preventative. His adoption fee of $200 benefits the rescued dogs of Lucky Dog. If you are interested in meeting and possibly adopting him, please contact Melia at melia88@comcast.net or 708-224-1900. He is being fostered in Chicago, Illinois.